Please join us for the Opening Reception of the “Artists of Ketchikan” Invitational Exhibit! 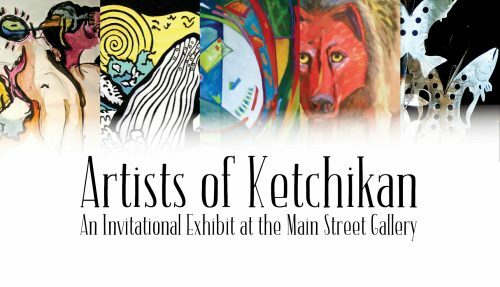 The Ketchikan Area Arts and Humanities Council and the Main Street Gallery Committee set aside the months of June and July for the annual Artists of Ketchikan Invitational Exhibit. This will be the third year for this invitational exhibit. This exhibit at the Main Street Gallery offers an introduction for our summertime visitors to the amazing and varied artists of our community! Featuring artwork by Carmel Anderson, Hall Anderson, Rhonda Green, Jim Guenther, Mary Ida Henrikson, Norman Jackson, Danelle Landis, Terry Lieberman, Maida Kelly, Sandy Shepard, Nancy Tietje , Steven Villano, Felix Wong, Evon Zerbetz, and more!